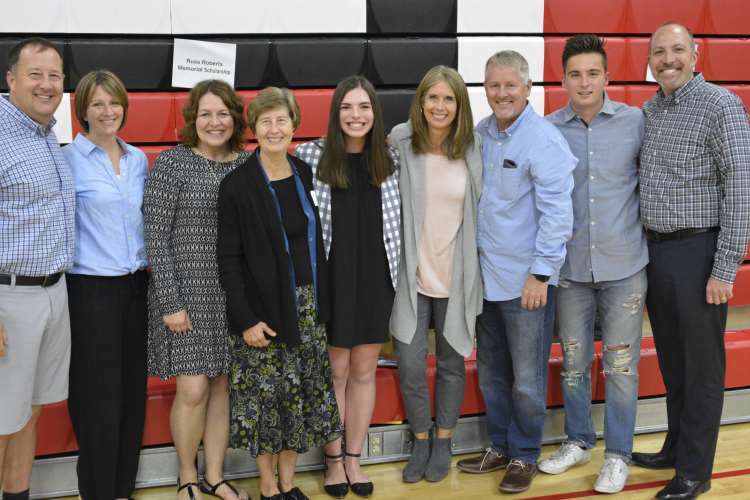 The Snohomish Education Foundation announced that, through fundraising and community donations, it has awarded 175 scholarships, totaling more than $180,000, to 125 graduating seniors from AIM, Snohomish, and Glacier Peak High Schools. The family of Russ Roberts Memorial Scholarship with scholarship recipient. “I am very excited for the Class of 2018 and all the opportunities that await them! It is a privilege to be part of a community scholarship program that is so supportive of our students and their goals and dreams,” said Carol Robinson, SEF Board member and Scholarship Committee Chair. The students were recently recognized at Senior Recognition Night at all three high schools. In attendance were members of the Snohomish School District Board, School District Administrators, teachers, families and friends. Since 1996, the Snohomish Education Foundation has awarded over $2,032,000 in scholarships to Snohomish School District graduates. In 2017, the Foundation added four new scholarships: Russ Roberts Memorial Scholarship, Scott Steed WSU Memorial Scholarship, SHS Class of 1952 Scholarship, and the Math, Science, & Engineering Scholarship from Donna Breske & Associates, Civil Engineers. The Foundation invites donations to existing scholarships or to establish new scholarships in honor of, a memorial, or by an organization, family or alumni group. SNOHOMISH EDUCATION FOUNDATION THANKS THE COMMUNITY FOR OVER $165,000.00 IN SCHOLARSHIPS!